Even as the pro AV industry hums along nicely half way through 2012 there remain challenges dealing with both technology and marketing changes afoot–many of which are the result of pressures from other industries. 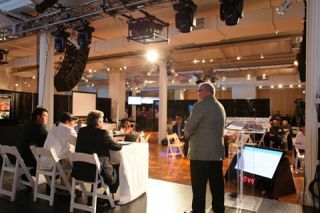 At the InfoComm/NewBay Media Roadshow, held Wednesday, July 25th at the Metropolitan Pavilion in New York City, 300 plus AV pros on hand got a look at some data related to these changes, and heard from a panel of pro AV stakeholders from several sides of the industry. At the Integrator–Consultant Panel at the InfoComm/NewBay Roadshow July 25th, Duffy Wilbert, senior vice president of member services, InfoComm International (on right, in photo), led a panel in a discussion about smart buildings, youth in the AV industry, digital signage, and sustainable AV. The panelists were (left to right in photo) Val Loh, associate partner/operation manager, Syska Hennessy Group, Inc.; Glenn Polly, president/founder, VideoSonic; and Felix Robinson, vice president, Strategic Accounts, AVI-SPL. Looking at a 2012 snapshot of key verticals globally, there was not much surprise: The corporate sector is still the single largest type by customer, representing 30% of the global market. Government/Military is 12%. Retail/Distribution, 6%. Venues/Events is a very healthy 14%. Education accounts for 9% of the global market. But note that “rest of market” accounts for 29%–meaning that there is still a lot of growth in the market overall–hence the lack of clear categories for that 29% chunk as many rollouts are going into areas that represent new categories (digital signage, for example). Sticking with the global overview, but switching to a product focus, Wilbert pointed out that over next three years, streaming media & webcasting will be fastest growing individual product category. In North America, the market will grow from $US 296 million in 2009, to $487 million in 2012 (projected), and $1 billion in 2015 (projected). These numbers are very much higher than both Europe and Asia will deliver, according to the InfoComm study. Shifting to trends, and growth predictions going forward, the InfoComm data indicates that Healthcare is fastest-growing segment of pro AV market. In North America Healthcare is showing the following growth: 2009: $US 959 million; 2010: $1.42; billion; 2011: $2.56 billion. There is considerable money flowing into Healthcare. New construction is the main driver, but renovations are also important. The study also noted the overlap between healthcare and education (as in the design of teaching hospitals). Digital Signage is of course a very fast-growing market. The session at the Roadshow touched briefly on digital signage, and Duffy pointed out some recent data from Intel that predicts there will be 10 million media players and 22 million digital signs in the world by 2015. This is a 26% CAGR from 2010 to 2015. Worldwide, the top three sectors are retail, corporate, and transportation, according to the InfoComm research. But healthcare and hospitality are seeing strong growth. Retail is the leading sector in all countries except China where transportation leads. Commenting on the above trends in the panel portion of the InfoComm session last week, the panelists noted changes in their own business practices to pursue the growing markets. Felix Robinson, VP of Strategic Accounts, AVI-SPL, said that they treat healthcare as a vertical market. They see this market as a video market primarily, and focus on big clients who can manage up to 50 hospitals each. Glenn Polly, President and Founder, VideoSonic, is a systems integrator, noted that one of the best parts of the healthcare market for them is the university teaching area. Val Loh, Associate Partner/Operation Manager, Syska Hennesy Group (a design consultant), pointed out that one of the big drivers going forward for the digital signage market will be when the “smart building” trend really takes hold, because digital signage will be part of the requirements in a smart building. In a Q&A session moderated by Duffy, with both the panelists and the Roadshow attendees, a variety of questions were raised about the nuances of the military market, managed services, staffing issues including recruiting, sustainability issues, and recurring revenue.